A chickpea (Cicer arietinum L.) Bacterial Artificial Chromosome (BAC) library from germplasm line, FLIP 84-92C, was constructed to facilitate positional cloning of disease resistance genes and physical mapping of the genome. The BAC library has 23,780 colonies and was calculated to comprise approximately 3.8 haploid-genome equivalents. Studies on 120 randomly chosen clones revealed an average insert size of 100 kb and no empty clones. 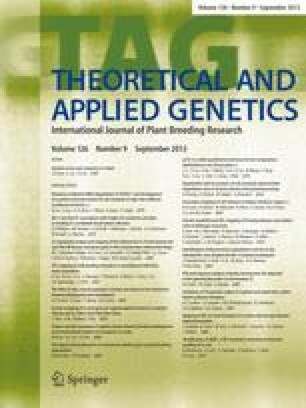 Colony hybridization using the RUBP carboxylase large subunit as a probe resulted in a very low percentage of chloroplast DNA contamination. Two clones with a combined insert size of 200 kb were isolated after the library was screened with a Sequence Tagged Microsatellite Site (STMS) marker, Ta96, which is tightly linked to a gene (Foc3) for resistance to fusarium wilt caused by Fusarium oxysporum Schlechtend. : Fr. f. sp. ciceris (Padwick) race 3 at a genetic distance of 1 cM. Also, these two clones were analyzed with several resistance gene analog (RGA) markers. End sequencing of these clones did not identify repetitive sequences. The development of the BAC library will facilitate isolation of Foc3 and allow us to perform physical mapping of this genomic region where additional R genes against other races of the wilt causing pathogen are positioned. The vector V41 was developed by Dr. J. D. G. Jones and generously provided by Dr. H. Zhang (Texas A&M University, USA). This work was supported by the McKnight Foundation, USA, through a collaborative project between Washington State University, Pullman, Washington, USA, the US Department of Agriculture, Agricultural Research Services and the Plant Molecular Biology Unit, National Chemical Laboratory, Pune, India. PNR wishes to thank the McKnight Foundation, USA, for providing the Fellowship that made the research possible.